The six elite 154-pound fighters competing on Saturday’s SHOWTIME CHAMPIONSHIP BOXING® tripleheader went face-to-face for the first time Thursday at the final press conference before they enter the ring live on SHOWTIME from The Chelsea inside The Cosmopolitan of Las Vegas. In attendance Thursday and headlining the event were WBA Super Welterweight World Champion Erislandy Lara and top contender Vanes Martirosyan. Televised coverage begins live on SHOWTIME at 9 p.m. 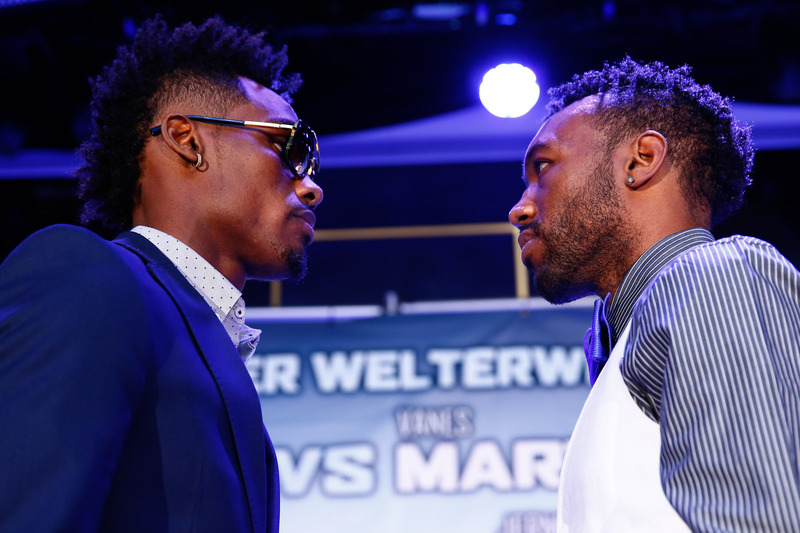 ET / 6 p.m. PT and features IBF Junior Middleweight World Champion Jermall Charlo taking on former champion Austin Trout plus undefeated challenger Jermell Charlo battling hard-hitting John Jackson for the vacant WBC Super Welterweight World Title. Tickets for the live event, which is promoted by Mayweather Promotions and TGB Promotions, are on sale now. Ticket prices start at $39, and are available online at www.cosmopolitanlasvegas.com or through Ticketmaster at (800) 745-3000;www.ticketmaster.com. Twin brothers Jermall and Jermell Charlo celebrated their 26th birthday Thursday and were celebrated with a cake at the final press conference that took place at Rose. Rabbit. Lie. at The Cosmopolitan. On Saturday they look to become the first twin brothers to hold world titles at the same time in the same weight class. “I plan on going in there and getting into my zone and making the adjustments that will allow me to be victorious. “One difference between this fight and our last fight is that I’m coming into this fight 100 percent healthy. I’m not making any excuses but I had a fractured knuckle going into our first fight. I still felt I was winning the fight. This time I’m not going to leave any doubt about who is the best. “I have no pressure on me. I feel calm. Part of that comes with experience but I also know that I’m going to go in there and execute my game plan like I always do. “I’m always stuck in controversial fights because of my fighting style. “I’m excited to be sharing the stage with the Charlo brothers. We have trained together, so being part of this with them is great. “Vanes’s a lot more passive than he was for the first fight. He was telling me I better be ready. “I’m going to do what I have to do. Put my game plan together, put my punches together, I’m going to do everything that I have to do to be victorious on Saturday night. “I’ve had a tremendous camp. I have a great team. I’ve had incredible sparring partners and I can’t wait for the real thing on Saturday. “I’m in the best shape of my life and I’ve never been so ready. I don’t have to tell you what I’m going to do up here, because you’re going to see it on Saturday night. Actions speak louder than words. This is going to be the best Vanes you’ll ever see. “This time around I am definitely going to be more aggressive. I cannot wait for Saturday. “There is a different feeling for me in this fight than ever before. It’s for a world title, this is as big as it gets. “It is the ‘Dream’ versus the ‘Nightmare,’ and you’ll definitely see the ‘Nightmare’ on Saturday night. “A fighter looking at another fighter. I see hunger in both eyes. “A lot of the first fight, I was kind of inexperienced but we’ve matured a lot throughout the years. Four years into this game, a lot of experience, a lot of knowledge in the game so there’s a lot I learned from the first fight. “Every fight on this card could have been the main event. To be on a card like this with all these great fighters is exciting. “Boxing has a lot of really big fights with the Charlos coming in the future. We’re going to take it one step at a time. This is a great fight that we have in front of us. “I’m very proud of my brother, to have accomplished what he has at 26-years-old, coming from where we came from. “This is a huge fight for me. This is more to me than winning a world title. I put my all into this. None of Trout’s experience matters. I’m a real lion and I’m going to show it. “Austin Trout is just a name to me. He beat Cotto, so what? I have work to do. I’m focused on getting the job done. “We (the brothers) both do different things, but we also have the same skills and the same power. No one in the division can match up to us. “We always thought that we would be winners and that we would be competing at the top level. Now it’s time to make history. We want to prove why we’re at the top. “Me and my brother have always wanted to be champions at the same time. There’s never been anything like this. This era, you will get a chance to enjoy us. We’ve worked very hard to get here and we’re going to reign on this level. “After this, I’m coming for the (160-pound fighters). To be a top pound-for-pound fighter you need to dominate different divisions and that is my goal. That doesn’t mean I’m struggling with weight. I feel good right now but I think I will be even stronger at 160. “It’s no coincidence that I’m back at the top making a title run. I paid my dues and put in all the hard work necessary. “I have nothing bad to say about Jermall as a person or a fighter. But at the end of the day, the history will be my own. I’m going to use him for my legacy, not the other way around. “I worked hard to get here. I’m sharp and on weight. There is nothing that I feel like he can do to beat me that night. “Charlo took a chance with this fight. There is no mistake in taking a chance. But will the chance end up in his favor? I hardly doubt it. This won’t be easy. I’m never in easy fights. They’re always great fights. “Size won’t be a problem. He still has to make 154 pounds. “I don’t want to tell you about his flaws because he might fix them by Saturday, but we see a couple flaws. “It may, it may not. We’re not looking at any extra edge or wishing to put all our eggs in one basket. What we’re banking on is our skillset and our grip to come out victorious. Whether it hurts him or not, it’s not going to matter. Only thing it’s going to do is make it easier for me. “I’ve been there, I’ve been to the deep waters. I’ve seen many different types of strategies and styles. In a sense, there’s nothing that he brings to the table that I haven’t seen before. “I appreciate everyone involved in putting this fight together. To me this is a card that people need to be pay attention to. I believe that everyone on this card is going to give it their all, because we all motivated each other to be here. “I’m fighting John Jackson, the son of a legend. I don’t believe John Jackson will be able to live up to his dad and if his dad ever had to face me, I would have beat him too. “We’re getting more and more experience. People thought that Gabriel Rosado was too big of a test for me but I dominated that fight. I’m going to pass any test they put in front of me. Over the course of time, you’re eventually going to have to say we the experience. “I’m proud of what my brother has done. His success motivates me. He’s a world champion. These are the kind of things we look forward to. “This is our time. There is no more that we can say. There is a lot that’s coming ahead of us. “I’m coming to win. I trained hard. It’s time for a world title for me. I have to fulfill my end of the bargain. John Jackson has been in wars, but so have I. This is our time, me and my brother’s. “Being on the same card as my brother is already a high standard so being on a card with the rest of the undercard guys, I’m honored and ready to show what I have to do. I’m ready to make history. I’m ready to win this belt and enjoy my vacation after. “I’m extremely blessed to be here. I’m looking to make history. My dad was a champion and I’m going to do the same thing. “Jermell is just selling the fight. We don’t take anything he says personally. We’ll humble him and put him in his place. “This is a dream come true and the Jackson legacy will live on. “He has a lot of flaws. How he leans forward and waits a lot. But his style is perfect for my style. I always bring it and give 100 percent and we’re looking for a stoppage.